One of the greatest aspects about Lighten Up Gear is that I get to meet and connect with a lot of great people. Ben Walters (AKA Illijam) and I met via social media networking and our friendship blossomed from there. 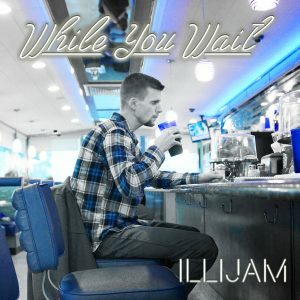 As my kids got older, they took a strong interest in Christian hip-hop and before you knew it, Illijam had made it into our family’s music rotation. With Ben’s new album coming out in September, I thought it would be a good time to reconnect and catch up. My prayer is that our conversation would be a blessing to you and that you can find hope in Jesus, even when it seems your world is dark and gloomy. Learn from Ben’s experiences and always keep pursuing Christ. Ben (Illijam): Hey Erik! It’s great to connect with you again too. Yes! A lot has changed since our December 2014 interview. And thank you brother. Graduating from college and getting married are enormous blessings, and I am grateful to God for them. Stephanie and I met at Faith Church nearby my home in Allentown, PA in June 2014. I had just gotten home from my junior year of college, and was fresh off of a very difficult break-up. My former girlfriend had been my best friend, and acclimating to life without her was not easy. So I ventured over to this new church in an effort to make some new friends, and was certainly not ready or looking for any kind of a romantic relationship at that time. Nevertheless, God introduced me to my eventual-wife the night of June 1st, 2014 at the church’s evening service. She was on the welcome team, and I joke that she was doing an extra thorough job of welcoming that night; she introduced herself to me, and we realized that we had gone to the same high-school together. We even graduated the same year and had homeroom together for 2 years, but never once spoke! I had a long ways to go as far as emotional healing, but something stuck out to me about Steph that night. Her love for God was obvious, she was serving him with her life, she was beautiful, and meeting her helped me believe that there might be another woman out there that I could walk side-by-side with as we pursued God together. God moves in a mysterious way, his wonders to perform! Fast forward about 18 months, and we are getting engaged December 12, 2015 in Washington Square in Philadelphia. A horse-drawn carriage took us through the historic district before letting us off there. It was only the two of us in the park, just like I had hoped. I looked up to the sky, prayed, “Here we go, Lord!”, got down on a knee, and asked her to marry me. She said yes!! One tip for guys killing time in Philly before proposing – don’t go to the Liberty Bell. We were in line to see it, and my heart stopped when I realized security protocol involved going through a metal detector. Some quick-thinking averted the crisis (i.e. “I forgot we need to do some Christmas shopping for my brother RIGHT NOW”), and the ring remained a surprise, haha. 7 months later, we got married! The wedding went off without a hitch. God blessed us with a beautiful, meaningful, Him-centered day, and even painted a masterpiece in the sky with a beautiful sunset at the end of our reception. Erik: Admission time. As much as I love music, my wife and I don’t share the same tastes. In fact, most of the time she’d rather enjoy silence. Is Stephanie a hip hop fan like yourself? Ben (Illijam): Stephanie is pretty open-minded when it comes to music preferences. She listened to rap/hip-hop in high-school, but got more into contemporary Christian folk bands in college. She is, nevertheless, extremely supportive of my music, and I am grateful for that. It takes a special kind of girl to support a musician’s calling, especially when said musician creates art within a genre his fellow Caucasians don’t always understand. Erik: I presume you aren’t a full-time hip hop artist yet so what are you doing vocationally in the meantime? Ben (Illijam): Yes, correct! I do not do music full-time yet, and I work a 9-5 job with a payroll provider called ADP. I am an inside salesman with them, and am really enjoying it. I would not have been able to work on much music or make many moves towards marriage were it not for this position. I’m also excited about the mission field my job is. It is a dark place, spiritually-speaking, and a lot of people there do not know God. I count it a great privilege to walk with the Lord at work, and hopefully reflect how good it is to know Him to them. Erik: How have you been able to juggle your marriage, working full-time and trying to launch a music career? Ben (Illijam): I suppose it has only been by God’s grace! This past year has certainly been the busiest of my life. Feeling God’s pleasure on me as I worked at all 3 of them was enormously motivating & strengthening too. I thought of it this way: Meeting a beautiful, godly woman who loves me and wants to glorify God with me was no coincidence; God gave me peace about that. The opportunity with ADP came literally out of thin-air in the form of a random call I received, and the successes God has given me & the opportunities to share about Jesus there have confirmed to me that it is God’s will for me presently. And God has continually opened doors for my music and introduced me to dear friends/family-in-Christ who have helped me along the way, so I feel confident He has a message he wants me to convey on His behalf through music. Feeling God’s approval on all 3 of these endeavors energized me to do each one as best as I could, for His glory. Erik: I was super excited to hear that you have a new project coming out called “Ironic Bombs.” That’s a super intriguing name for an album…what’s the main idea behind the name? And when does this album officially launch? Ben (Illijam): Yes! “Ironic Bombs” will be available 09.09.16 on iTunes, Google Play, & everywhere else. Hard copies will also be available via my website. And regarding the main idea behind the album, I’d like to answer it this way. Something is ironic if it happens in the opposite way of what you would expect. Bombs, whether actual or metaphorical, destroy, devastate, kill, & ruin life as we know it. A bomb is not ironic if it does those things; that is what we would expect them to do. So my question is: what if these bomb blasts are being orchestrated to create something beautiful? Those would be Ironic Bombs. Erik: Calamities and devastation are pretty heavy words. What struggles in your life influenced the songs on the album? Ben (Illijam): They are heavy words. This album is a memoir of the break-up I underwent during my junior year of college; it is also about what God taught me through it. I wanted to recount things in detail here – perhaps it’ll help someone else who’s going through/or been through something similar – so if readers would prefer to skip down, feel free. It’s odd to recount some of these things now, being happily married to my wonderful wife & fully confident that what happened was God’s good, perfect will; but I would misrepresent & undermine what God delivered me from to try to paint the picture any other way. I hope to do so in a way that is fair, respectful, gracious, & tenderhearted. I met a young lady in my junior year of high-school, and became very fond of her. I discovered as we talked that she was a new follower of Jesus, and so I asked God if He’d be pleased for us to do life together & strive to keep Him in the center of the relationship. I felt peace from Him about it, and we began dating. I believe we endeavored to keep God in the center & count each other as loss compared to knowing Him – far from perfectly of course, but sincerely. We enjoyed a happy, marriage-minded relationship, I became deeply in love with her, and I earnestly hoped to spend the rest of my life with her. It was a good thing. Some would say we were too young to think about marriage. But if two people will date in a manner honoring to God, I believe they must think seriously about marrying, lest our dating habits devolve into cheap, shallow, commitment-less flings. 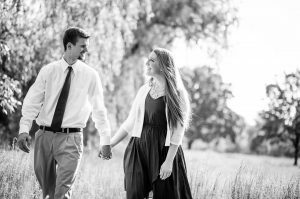 Dating between two Christians does not necessarily have to result in marriage – that’s not always God’s will for bringing two people together –, but we should actively ponder “Should I marry this person?” as we date. And so we did. A couple of years went by. I went to college in VA, and the relationship stayed strong, despite the distance. She went to college the following year, and the relationship seemed to remain sturdy. We then began to take some serious commitment-type steps towards marriage, which confirmed me in my yearning & made me all the more eager. In retrospect, I think the relationship began to change here, but I didn’t see it. When exactly our desires began to differ I cannot say, but perhaps it was when she realized how serious I was about her. I can understand how my resolve & drive to be together may have been intimidating to a fellow 20-year-old. Or perhaps God simply began to stir in her that us being together was not the plan going forward. I did not have these reservations, and just figured that because I loved her, we loved God, and we wanted to glorify Him together, there was no reason to question it. But even very good desires may not be God’s will. On February 12, 2014, the bomb dropped. It was snowing heavily that night as I picked up my iPhone 4s in my Liberty University dorm room. What I thought would be a pleasant, routine phone call with my best friend turned out to be anything but. I laid on my couch in shock, staring at the ceiling as I tried to stomach words I never thought I would hear. My up-until-then girlfriend & closest friend explained to me through tears how her heart had been changing – how she could no longer see herself marrying me, that although she cared for me as a brother-in-Christ, she no longer had any romantic feelings for me, and that I should not hold on or try to wait for her. That was a devastating nuke; I was heartbroken. I could tell she cared for me and hated how much it all hurt me, but I suppose that is just the difficult thing about a sudden, non-mutual break-up, or any break-up: they hurt. It’s the death of a good thing and it’s hard. Though the one party is sure it is what God would have them do, it takes a long time for the other party to catch-up. The grief was doubly heavy, because she also expressed that she was struggling with her faith in light of some other things going on which she did not wish to disclose. I realized that breaking-up meant I could no longer be there to encourage her spiritually, and I was no longer in her confidence. More bombs. From then on, I began the arduous, excruciating, & perplexing process of trying to go on. I lost my appetite. I couldn’t sleep, and when I did, my dreams were emotionally torturous. I remember the fragility of heart I used to experience, and how my peace-of-mind could be suddenly smashed & replaced with hot, toxic grief at a mere thought or the sight of some happy memory on social media. In an effort to respect her wishes to not hold on, I took down all the pictures of us, and then stayed off social media for a while. I was so insecure. I struggled with self-loathing. I longed for reconciliation, and vainly read into things. I was having a crisis of faith, as the plan I thought God had for me seemed to unravel. Being alive hurt, and there was little relief. I was tempted to seek relief in crazy, perverse ways, which shocked & appalled me. I was tempted to do things I never used to conceive of in order to numb the heartache & fill my longing for acceptance, intimacy, and relational fulfillment (I thank God for keeping me from those temptations, and sparing my wife & I from that baggage). I spent hours praying & journaling, and I tried to read God’s Word as much as I could; it was the only relief I could find. It was such a dark, painful, confusing time. I especially struggled with accepting how things had changed between us. My throbbing heart insisted that she was still that same familiar friend, but she couldn’t be; a fractured romantic relationship rarely affords any kind of comparable closeness. I desired to speak with her afterwards, perhaps to gain some closure, but there never seemed to be an organic opportunity. And perhaps I sought in ‘closure’ what God has designed us to only find by having faith in Him. There were a few times that we texted after we broke-up, but I rarely left those exchanges in a good state. I was fishing for traces of our former relationship, but was only further hurt to realize again how much had changed. I perceived her as being cold, callous, distant, and even unkind at the time, but I don’t believe that was the case anymore. Post break-up communication can never be as warm, intimate, or close as before, and I see that now. I sympathize with her, because I can imagine her position was also very difficult. It was just hard all around! But God is good. The album chronicles this painful event in my life: the dropping of the bomb, the aftermath, moving on, learning to love & trust again… and it highlights how God faithfully carried me & walked with me through it all, comforted my heart, strengthened me to trust His Promises over my perception, and showed me that He is Enough when our dreams are blown to oblivion. He grew me so much closer to Him in that time. I have often worried during the recording of this album that some would construe it as vindictive or unkind. That is emphatically not my heart. I have no desire to write spiteful break-up songs. In this album, I have endeavored to honestly recount how I felt during this season in my life. Sometimes, I felt bitter. Other times, I was mad at God. Sometimes, I felt traumatized & grieved. Other times, I doubted my faith. Sometimes, I lived in the past. Sometimes, I missed my former girlfriend. Sometimes, I felt strong and like I could move on. The next moment, perhaps I relapsed. I mean to convey that I had this spectrum of feelings, but I by no means am saying that they were right – just that I struggled with them. And if someone listens from beginning to end, I think they’ll understand the progression. And they’ll see how God was faithful to bring me through it all, even when I was a complete mess. Erik: I believe that when we walk through valleys of darkness, God is both trying to draw us closer to dependence in Him and sanctifying us to be more like Jesus. How did God mold you during this time? Ben (Illijam): I believe that too. And God did a lot of molding in my heart during that season of suffering. Time would fail me to recount all that God taught me, but let me share a few. I love what A.W. Tozer said when he wrote, “It is doubtful whether God can bless a man greatly until He has hurt him deeply.” It is rare for God to give His children the blessing of soul-satisfying intimacy with Him (and ever-increasing degrees of it!) without bringing them through great suffering. It is the pattern we see in Scripture, evident in the lives of Paul, Job, Joseph, and many other great men & women in the faith. If we decide to follow Jesus, we have chosen a path of great pain. But O, is it worth it! There is no greater gain, no greater treasure, than Jesus. Knowing Him, walking with Him, enjoying Him – it is worth enduring a million heartaches. And so we will suffer if we want to know Him. I also learned more of what it means to wait patiently on God. John Piper defines patience as being “In God’s place, at God’s pace.” When God ordains painful, Providential red-lights, it is so tempting to run ahead of Him, because waiting hurts. Ironically enough, however, running ahead of Him will hurt us even more. I was sustained by a number of God’s promises regarding waiting, especially Isaiah 64:4 “….God acts [works] for those who wait for Him.” Though waiting may feel like inefficiency, we trust that God is invisibly, imperceptibly working on our behalf with His infinite power to bring about what is best for us. To run ahead of him, impatiently manufacturing man-made solutions to solve God-sized problems, is to forfeit that power working for us. Waiting on God is by no means passive; it is an active, tenacious fight to trust Him while we hurt and don’t understand. And so we must wait on God, and trust Him to work for us. A hurting heart is also apt to spew venomous words; someone once said that hurt people hurt people. But God taught me to vent to Him in prayer and to a few trusted people, rather than on social media or to other people to whom it would not be appropriate. Proverbs 29:11 says “A fool gives full vent to his spirit, but a wise man quietly holds it back.” And so we pour our hearts out to God. God dealt with a lot of my heart’s idolatry too. He showed me that one cannot rely on another fellow sinner to do for us what only God can. My loved ones will let me down, and I’ll let them down. But God will never let us down. He showed me that He is Enough. I don’t need to be in a relationship to be happy. I don’t need anyone’s approval – even the approval of those I most sorely desire it from – to be at peace. God is all we need. It’s okay to not be okay. Don’t add guilt to grief by feeling bad about feeling bad. Does not the Gospel tell us that the prerequisite for receiving salvation is being honest about our brokenness & need? It may be our pride that’s keeping us from admitting how hurt we are. We need to humble ourselves, admit to God how broken we are, and keep going to Jesus. Be careful not to minimize your suffering or anybody else’s. Our suffering is often complex, deep, & painful. There are no short, pat answers that can make it all better. Don’t pressure yourself or others to ‘feel okay’ when you are not. Trust God to heal & deliver you in His timing; trust God to do the same for your loved ones. When you’re with someone who is hurting, try not to talk too much. We cannot ‘fix’ things. Allow them to vent, and listen graciously. We do not need to rebuke every hard word that suffering might cause a soul to say. We just listen, love, grieve with them, and tactfully share truth. Don’t over-stress when you don’t suffer perfectly; Jesus suffered perfectly on your behalf because God knew you wouldn’t. God attributes Christ’s perfection to you. Rest. Your suffering now will become your ministry later. If you trust God during dark days, He will comfort you & restore you. And then, God will give you the great privilege of sitting across the table from someone else going through something similar to what you went through, and you will be able to testify how God delivered you and assure them that He will bring them through it too. People who rely on God for help to endure deep pain will have profoundly encouraging words for other hurting hearts. There was so much else, but I lingered on this final thought the most. As time went by and I began to recover, it encouraged me so much. Romans 8:28 declares, “And we know that for those who love God all things work together for good, for those who are called according to his purpose.” Wow! Is that not breathtaking? God promises to work all things for our good! This includes even the excruciating, evil, unjust, perplexing, traumatic, gut-wrenching, knock-the-wind-out-of-your soul things. And therefore, every devastating life-bomb that drops on us is utterly ironic, because God will causes it to turn out for our good. We can scoff when Satan tries to tell us that something bad will ruin us; we know that God is going to cause it to work out for our good! There is no scheme the devil or man can employ to truly ruin God’s Saints. Jesus will manipulate evil into giving His children what is best for them. We see this no more poignantly than at the Cross, where God took the worst injustice – the crucifixion of the perfect Creator by His own criminal creatures –, the most perplexing evil – the apparent defeat of God as He was shamefully condemned as a criminal and murdered –, and the most excruciating suffering ever experienced – the torture of Roman crucifixion coupled with the mysterious Hell-wrath of God poured out on Jesus – and He worked it for the highest possible good: the glorification of Himself and the salvation of sinners. God already worked the worst bad for the best good. And so we can fully trust that He will work our lesser (though still difficult – God knows that) trials for our good. This truth may take a long time to stomach, and it is emphatically not an instant cure-all to grief; but I believe that, by-&-by, it is one of the key doctrines that will encourage & sustain us through our suffering until we are Home. Erik: I went through some personal, dark times in my life as well but instead of running to Jesus, I actually listened to a lot of Eminem’s “Recovery” album. Since then, artists like NF have emerged in the Christian hip hop scene and have been transparent about their struggles in life but also their hope in Jesus. Were there artists you identified with during this season in your life and while writing and recording the album? Ben (Illijam): Yes, there certainly were. I identified the most with artists who had written songs that expressed their suffering & preached the truths I needed to hear from God’s Word. I listened to KB’s EP “100” & Tedashii’s “Below Paradise” extensively during that time, as well as Dream Junkies “NREM Editon”, Wit & Dre Murray’s “Hell’s Paradise II”, and songs by MC Jin, Da’ T.R.U.T.H., Andy Mineo, Christon Gray, Json, and others. Erik: Did you work with Jungle Hype and Magoh again on this album and are you guys still playing dates together? Ben (Illijam): I did not have the opportunity to work with my friend & former roommate Magoh on this one, as he is still settling into his position at Second Baptist Church in Houston, TX. He has plans of getting back in the studio, Lord-willing. We did get to rock a show together in Topeka, Kanas this past January however. That was awesome!! And I did work on a song with my other friend & former roommate Jungle Hype, who is now going by his birth-name, Erik Kingsley. Erik is one of the in-house producers for Kings Dream Entertainment & Dream Junkies now, which is dope!! I’m super proud of him and excited for him. Erik: I was stoked to see Rapzilla recently promote one of your songs from your upcoming album. How’d that feel? Did you feel affirmed as an artist? Ben (Illijam): That was definitely a blessing, and was very encouraging. A note: Building relationships in the music industry takes time, consistency, professionalism, finances, marketing, and perhaps most of all, Spirit-empowered meekness. It’s always tough to balance marketing & meekness…or to market meekly I suppose. Meekness is the quiet strength to refrain from anxious self-promotion, and to trust that God will use you to speak to whomever He wills, will give you favor in the eyes of whomever He wills, and that “it’s better to be marked by God than marketed by man” (Christine Caine). We have to be content there. This doesn’t rule out an artist’s responsibility to promote his/her music or invest in marketing, of course. It’s just all about the heart. And so we put God first, seek our soul’s satisfaction in Him above all, and then do everything else (make music & market it) for His glory. I digress. It has been encouraging to build with Rapzilla. Philip Rood & Chad Horton are great guys, and I am thankful to be co-laboring with them and getting the Gospel/the music out to more folks. 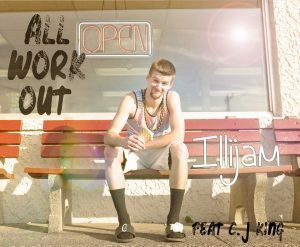 Erik: CJ King was featured on “All Work Out.” How did you get connected with him and are their other artists featured on your upcoming album? Ben (Illijam): CJ and I met during our time at Liberty University (2011 – 2015). We started attending “Young Man Rumble” Bible Study on Wednesdays, led by our mutual friend Jason Lewis, aka Humble Tip. We bonded over our love for the Lord, music, and reaching people with the Gospel through music. CJ even helped me to record, mix, & master my very first mixtape “The Sojournal” in the Fall of 2012. We recorded it in his dorm room, which was an old motel LU had purchased and renovated. If anybody goes back and listens to it, be nice to me – it was my first step into the musical world haha. CJ is super talented & sincerely loves the Lord. Be on the lookout for him, as he is definitely on the rise. Yes! I had the privilege of working with a lot of other artists for this album, many of them close friends: Rapzilla’s Best New Artist of 2015 WxNDER y, seasoned Hip-Hop veteran Humble-Tip, super talented fellow up-&-comers like my friends CJ King, Aklesso & Tom Szoch, the metal band Alive In Color (FKA Sinners to Saints), the modern-day hymn writing group Bifrost Arts, & burgeoning pop artist Cristabelle Braden. And that’s not to mention the many producers and engineers who worked to make this album possible. My good friend & brother-in-Christ Rey Santiago aka Rey.Oh.Eight put a tremendous amount of time into this album. He is without a doubt the main maestro that brought this project to life. Matt Russel aka RunFree, another “Count It Loss” producer, also contributed a song, as did Gabe Ramirez, who is Marz Ferrer’s husband. 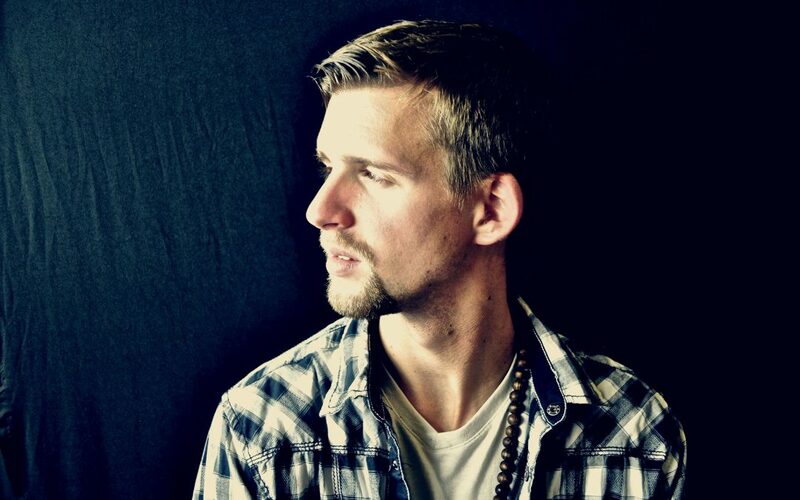 My friend & former roommate, Erik Kingsley, produced a track. Alive In Color & engineer Dylan Werle helped out. Halo Hitz produced a song. 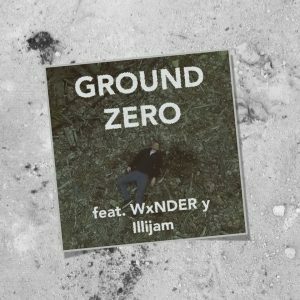 My man Skyler Young mixed/mastered a song. And big shout-out to my man Adrian Stresow, one of Rapzilla’s 15 Freshmen of 2016, who mixed/mastered almost the entire album. That dude worked with me tirelessly. Erik: Tonight, my family watched your Ironic Bombs promotional video. “That album cover is dope!” chimed one of my sons. Who tackled the artwork for your new album? 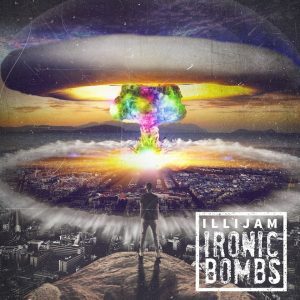 Ben (Illijam): I am glad you all are digging the artwork! My man Jodie Walton III of T38 Creations designed it. He has the unique gift of being able to take my disjointed, embryonic ideas and turning them into real works of art. I pitched the idea to him & told him I wanted to be overlooking something being destroyed by a multi-colored atom bomb (an ironically beautiful blast), and he did the rest. I believe he used a city in France for the cover, if you look at some of the landmarks closely…No shade on the French though; I am part French after all, haha. Erik: What’s next for you when the album comes out and how can our readers connect with you to book you for a show? Ben (Illijam): You know something, I am not sure! I am eager to use the Ironic Bombs metaphor & the Scriptural truth behind it to share the Gospel & comfort folks who are hurting, so wherever God opens a door to do so, I’ll be there. Whether full-time or part-time, I pray God gives me the grace to be faithful to His call. 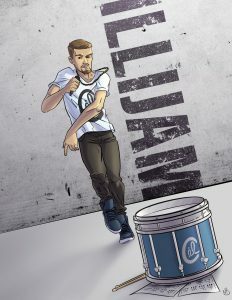 For anyone interested in booking me for a show, all they have to do is go to http://www.illijam.com/contact/ or email me directly at illijammusic@gmail.com. I promise to come Spirit-filled, preach the Gospel faithfully, put on a great show, and I won’t break the bank. I’ll encourage all who will listen to “count everything as loss because of the surpassing worth of knowing Christ Jesus our Lord” (Philippians 3:8). I am so joyful that the bombs you have had in your life have turned you to look closer to God who ironically turned them into joy.